Haitian earthquake survivors and aid workers desperately need clean water. One nurse says she's been at a tent city with thousands of displaced people since Tuesday with no water. In her words, "We can't cook food. We can't do anything." A woman at a water treatment facility was selling the last few bottles of treated water today. She says the plant won't produce more until electricity is restored to Port-au-Prince. An Oxfam official says Haiti's water system wasn't very good before the quake and he doesn't know how bad it is now that it has been damaged. 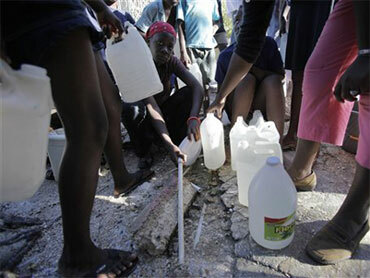 Oxfam had water supplies in Haiti left over from a 2008 storm. It has managed to get some 2,000-5,000-liter tanks into the capital city. U.S. military officials say helicopters are ferrying water and other supplies off the USS Carl Vinson into the airport.